Last week, we discussed why we should all be explicitly teaching the Crosscutting Concepts in our NGSS science classrooms. If you missed that post, head over here! But what do we actually DO with the Crosscutting Concepts? Here are some basic DO’S and DON’TS when it comes to incorporating the Crosscutting Concepts into your daily instruction. DO: Repeat crosscutting concepts again and again. When it comes to performance expectations, the same content is NOT taught from year to year and course to course. Content builds but is not repeated. The crosscutting concepts, on the other hand, should be repeated from year to year and course to course and frequently within courses! DO: Increase complexity and sophistication across grade levels. That said, the same understanding of patterns in a second grade class will not suffice for a high school course. Crosscutting concepts grow in complexity and sophistication, and student understanding of the concepts and how they can be used to better understand science content and practices must deepen over the years. DO: Recognize that the Crosscutting Concepts are complex, and Performance Expectations typically reflect only some aspects of a concept. When you take a look at the NSTA’s matrix, you’ll notice that the complexity of understanding expected obviously increases. This makes it very difficult for a single performance expectation, a single activity, or an assessment to address all aspects of each crosscutting concept. This is another reason why repetition is so important. Students will need to come back to each crosscutting concept again and again, understanding a different facet of the concept each time. DO NOT: Assess crosscutting concepts apart from the practices or core ideas. Whatever you do, the crosscutting concepts were designed to be fully integrated into your content and practices, and you should NOT be teaching or assessing crosscutting concepts devoid of connection to your curriculum. Your students aren’t engaged. They aren’t thinking. They don’t care. And you’re just tired of teaching with notes and lectures and texts. Sound familiar? It’s time to try something new. 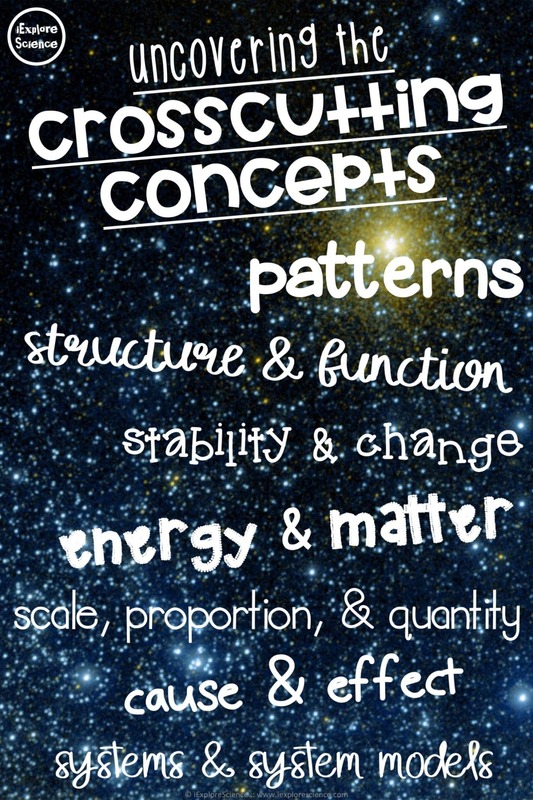 The Crosscutting Concepts are just ONE part of NGSS-aligned, three dimensional instruction. To truly engage your students, you need to put together the complete puzzle. We at iExploreScience can help! You can learn more about transforming your instruction as you learn to teach with the NGSS at the Science Teacher Tribe. As a Science Teacher Tribe member, you get access to a professional development community full of resources designed to help you make the transition simply and smoothly. I’m not going to lie – it definitely takes some work, but it doesn’t have to be confusing or overwhelming or a struggle. It’s about adopting a new mindset, and our workshops and resources are designed to support you through it. Learn more here, and check with your district about obtaining funding.